Practice Area: This course has a great practice area where you can cover all aspects of your game, including grass tees on the driving range, a spacious chipping and bunker practice green, and a large putting green. 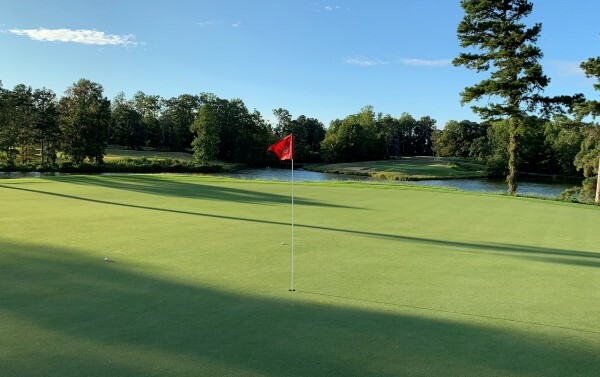 Description: Warrior Golf Club is located in China Grove about 30 minutes north of Charlotte and conveniently accessible from both I-85 and I-77. Warrior offers a large practice area, five sets of tees, six miles of concrete cart parts, eleven ponds, over forty bunkers, and dual line irrigation. 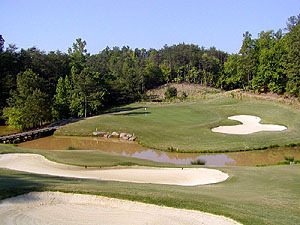 Designed in 1999 by Stan Gentry, Warrior Golf Club was built around the beautiful 52-acre Lake Wright. Warrior is a par-71 with over 6,600 yards of rolling terrain and Bermuda fairways with Champion G12 Ultra Dwarf Bermuda Greens (2018). Notes: The golf carts now include touch screen GPS. B-Man's Take: Warrior is a nice course for those north of Charlotte. It's tucked in a little community. So you do get some O.B. spots here and there. Quite a few hazards, too. It's got very few flat holes. Almost every one is rolling hills and sloping fairways. While the tees, fairways and rough can be spotty, the greens are kept in very good shape -- but you may have some long putts cause the greens are all very spacious. There are some good scoring opportunities with most of the par 5's reachable and 3 of the 5 par 3's are medium irons with no trouble in play. My favorite hole is the short downhill par 4 15th. There some strategically placed pot bunkers in the fairway, but the approach has a nice view with the lake behind the green and it should be a wedge to try to make birdie. I despise the 10th hole. This brutal 435-yd par 4 has a small landing area off the tee and then requires a very long uphill approach to a well-protected green. And watch out for the blind 2nd shot on #11 with a large bunker fronting the green. This course is a nice change from some of the Charlotte area courses and is worth the extra drive. 7/29/18 - Msg Board Posting by BetterThanMost titled "Couple of Updates"
6/15/18 - Warrior Golf Club closed for a greens renovation on 5/29. The course is targeting an early August re-open. They are switching over from Bent Grass to Champion G12 Ultra Dwarf Bermuda. They've already removed ~2000 trees to maximize sunlight and airflow to the new greens. Further upgrades to the irrigation system and walk mowers will keep the course in great shape moving forward. They also have a new fleet of golf carts equipped with GPS -- which means they will keep you from getting close to the greens and tees. Mike Cagiano is the new superintendent who started last Fall -- he came over from River Run. The course should have a great setup once it re-opens in August.